Marissa Mayer was wrong to deny flexibility to Yahoo! workers, but is telecommuting the right long-term solution for employees with families? Let me be clear. I am not a fan of Yahoo! 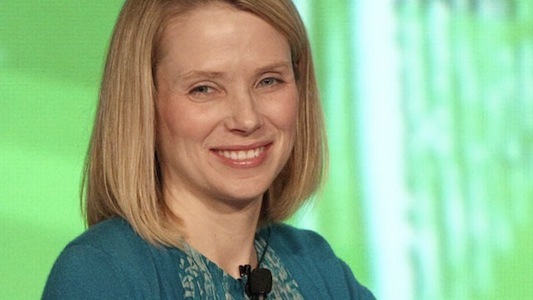 CEO Marissa Mayer, who until now has been most famous in the parenting world for her abbreviated maternity leave. At the time, I had sympathy for the new CEO who most likely felt tremendous workplace cultural pressure to demonstrate that new motherhood would not affect her professional competence as a corporate executive. But after her baby was born and she said that taking care of a baby is “way easier than everyone made it out to be,” she completely lost me—a mom of a baby who endured months of colic as well as unending sleep and digestive problems. Yes, I’m sure new parenthood is quite easy—if you’re a boss with unlimited resources and nannies and are blessed with a healthy, easy baby, I thought. Mayer stepped in it again this week, enraging working parents, feminists, corporate observers…well, pretty much everybody. She announced a few days ago that Yahoo! employees will no longer be permitted to work remotely from home. What’s the reasoning behind Mayer’s new policy? It’s been speculated that she’s trying to get rid of “unproductive,” remote employees in an easy, efficient manner. I agree with other commenters that Mayer’s move is unwise, a top-down solution that will do nothing to help the parents of small children, who require all kinds of flexibility in the real world, such as when children are sick and when negotiating pick-up and drop-off times at childcare facilities. However, I think the solution of “working from home” can also present other problems, and I don’t see much critical conversation about these trade-offs. I know that the research on flexibility in the workplace is encouraging about the potential for a more flexible workplace, finding that workers may actually be more productive when they have flexible schedules. But I think “flexibility” in work schedules is different from “telecommuting.” And I can understand Mayer’s qualms about employees spending most of their time at home, and I also don’t ultimately think that telecommuting is a good long-term policy solution to our society’s work/family balance problems or even for women. When my son was an infant and young toddler last year, my “job” was analyzing research data and writing my dissertation. Although it was not paid employment, this was my major professional goal that needed to be accomplished. My dissertation work required many types of tasks: researching databases, summarizing articles, writing memos, correspondence with faculty members, using software to analyze interview data, highlighting passages from the interview text, etc. After several months of trying to combine infant care with dissertation work, I was simply getting nothing accomplished and doing a poor job at both things. My son’s naps were unpredictable and generally short. He would play for short periods alone but then become frustrated and scream when I worked at the computer. I tried to work at night, when my husband got home from work, but I was mentally exhausted from a full day of child care and had trouble thinking or making connections in the data. Then I hired a babysitter to come to our house for a couple hours during a few days of the week. This was not a solution either, in our small house with my loud, active child running all around and often crying for me. So, finally, my son now attends a part-time preschool program during the mornings. Within a couple of weeks of my son’s start, I had nearly finished my dissertation draft and accomplished more in two weeks of quiet, uninterrupted time than I had in nearly a year being at home with a baby, even with a babysitter. My experience demonstrated for me the difficulties and peril of “blending life and work.” Our brains are simply not designed to do our best thinking when we are multi-tasking. As science and learning writer Annie Murphy Paul states, “The reason multitasking is detrimental to learning holds for young people as well as adults: The brain can’t really pay attention to more than one thing at a time. Rather, it switches its focus between the two tasks, making us slower and less accurate at both.” When our minds are torn between the spreadsheet on our computer and the baby in the next room crying because he is refusing to nap, we become stressed because we can’t do either job very well. I do think that Mayer is wrong to deny flexibility to workers who want to design their own schedules in an imperfect world with few policy solutions or structural help—such as subsidized day care—for families. But I also think a conversation is worth having about whether “telecommuting” and “working from home” should be viewed always as a positive step for women or as a solution on its own. In many cases, it makes sense to work from home for part of the day—to avoid rush hour commutes, for example—and many women are able to create schedules for their families, with the help of spouses and other friends and family members, that prevent some of these issues. But from my experience, and others I’ve spoken to who have tried it, working from home can create an additional level of stress and make women feel more isolated and overburdened. However, with her ban, Mayer continues to show insensitivity to the real dilemmas in women’s lives. Instead of evaluating the potential for workplace productivity for each woman and her situation on a case by case basis, Mayer told workers that they would get no help at all from their employer in coming up with a patchwork solution to meet their needs. And that makes no sense at all. Jessica Smock lives in Buffalo, New York, with her husband and toddler son. She is a doctoral candidate and Glenn Fellow in educational policy at Boston University and has a blog called School of Smock. Her research is about the experiences of African American girls at elite boarding schools. She is a graduate of Wesleyan University, where she majored in sociology and wrote her honors thesis about the evolving identity of new mothers, and she received her master’s degree in history and education at Boston University. She was a teacher for more than a decade at private and public schools in the Boston area before becoming a freelance writer and blogger.